On Thursday last, the victorious Under-21 team their families along with fellow members of Bryansford GAC were in Stormont for a Civic Reception where they met local MLA’s Caitriona Ruane, Chris Hazzard and John McAllister. They were congratulated on winning the Ulster Championship and it was highlighted that how they can benefit from sport and how they had brought great delight to the community in what they had achieved. 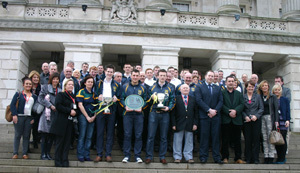 The Ulster U-21 Champions – Bryansford GAC at Stormont. This Friday the boys will be visiting the local primary schools with the Down and Ulster Cups – the minibus will leave St Patrick’s Park at 9.55am with Carnacaville the first stop. The seconds game was postponed due to waterlogged pitch. A new date to be arranged. On Saturday 16 March the Social Club will officially reopen. The Cow Pat will be held from 5.30pm with music following from Finbar Keaveney. All Cow Pat cards to be returned this Friday Night. 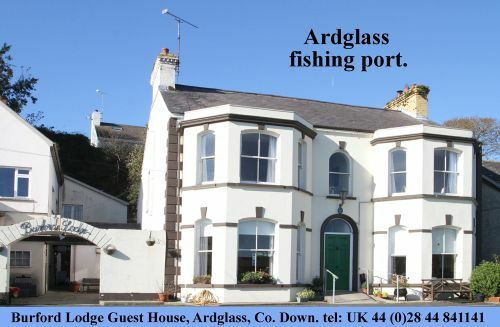 The Social Club is available for Parties / receptions etc – contact Paul Laverty. There will be a Senior Panel Meeting this Friday after training – All Players to attend. Adult Membership is currently being collected and needs completed by 31 March – please see any committee member on this. ‘Bryansford presents Strictly Come Dancing’ launch night on Friday 22 March 2013 in our newly refurbished Social Club at 9pm. Followed by finger buffet and Music. It is hoped a good crowd will show up to see the partners being paired in what promises to be the most successful show produced in the history of Bryansford GAC! Over the coming weeks we will be looking for Volunteers to help out at this event and it is hoped Members will be willing to help out. It is hoped to order equipment in the coming weeks for all teams – managers to forward list asap. Congratulations to our Chairman Ronan McVeigh and wife Carolynne on the birth of their daughter and to Aodhan and Claire Sheilds on their new baby boy – well done!